As Deborah attempt to coordinate her knee-socks, Melanie’s neighbourhood gets to know her a bit more than she intended. Deborah describes her experience test-knitting the Linda Butterfly Socks, and takes on some New Years resolutions with her “Emerald” hand-spun sweater. Our Bringing It Back words are shenanigans and tomfoolery. See if you can use them in a conversation this week. Melanie gets a little incentive to finish her socks. But will she do it? Listen to her Yarn Diary entries to find out. 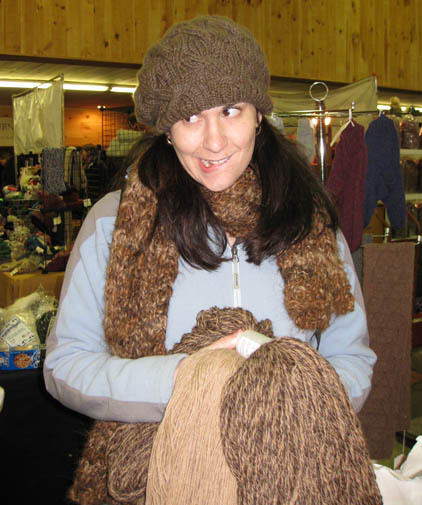 Deborah talks about the yarn she used to make Melanie’s Star-Crossed Slouchy Beret, and interviews with Montevideo-based 100 Pure Wool. Don’t forget to enter our contest! Leave your confession in the comments, or on Ravelry. Listener Bowerbird, along with many other knitters, are donating some or all of the proceeds from their pattern sales to the earthquake relief effort in Haiti. Bowerbird (Rebekkah) will donate all of the net profits from sales of her patterns, through the end of this month. 5 Responses to "Episode 18 – Mittens, Socks, and All Those Shenanigans"
Loved the show. I’m new to your podcast, but you guys make me laugh! Deborah makes me jealous of all the cheap great yarn in Uruguay! Melanie is hilarious & such a talented singer! I hope I got the names right ;o) …. if not, forgive the newbie! I am enjoying your podcast MORE than I could EVER put in to words! I must look ridiculous laughing outloud alone in my car!!!! I love how the story in this episode contains a story (3 little kittens who lost their mittens) you included in an earlier episode! It’s like a play within a play, but with mittens! Oh!! I forgot to mention how much I LOVE your yarn diary entries Melanie! You should bring these back in upcoming episodes!